I've been asked this question by friends and readers. "Why write a series with the last one first, the first one second, the fourth one third and the second one fourth, with the third one still in the works?" It's a good question. The simple answer is that I wrote them as they occurred to me. I studied ancient and medieval history when I attended college. I encountered 'those weird Egyptians' during the course of my studies and found, to my surprise, that they were just like the rest of us. In some ways they were rather nicer. I read the famous accounts of the scandal of tomb robberies, and I imagined someone caught in the middle of them, fighting them alone... A Killing Among the Dead, set during the times of hardship and strife that marked the end of Egypt's New Kingdom arose from those thoughts. In the course of that story I mentioned a king's sojourn in the village of the workers over a century before the time of that book. Perhaps five years later, planning for a trip to Egypt, I saw a photograph of a fallen colossus from the temple of Ptah in what had been Memphis. I could imagine that monolith toppling - and what if it had been in the middle of a festival? And what would have made it fall? And so Pharaoh's Son came about. 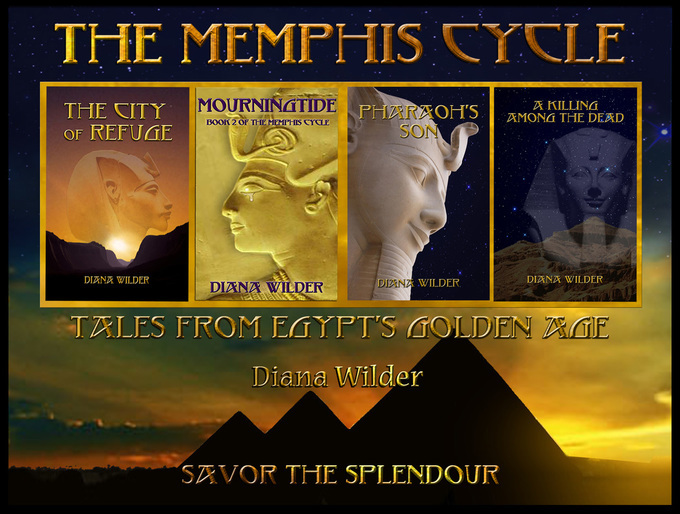 The story was situated in Memphis, since one of Ramesses the Great's most famous sons, who was Crown Prince for five years toward the end of Ramesses' life, was High Priest of Ptah, whose worship was centered in Memphis. I was familiar with Khaemwaset ('Khay'), having written some short pieces about him. I mentioned a long dead High Priest, Nebamun, in that story. Some years after I finished the first draft of Pharaoh's Son, sorting through my notes, I had a mental picture of a group of people camped at a ruined city and waiting for supplies. Why were they there? Stories take years to write, of course. It turned out that the ruined city was Akhenaten's old capital, Akhet-Aten ('Horizon of the Aten'), and so The City of Refuge came about. It took place 52 years before Pharaoh's Son (Ramesses, age 52 during that story, was born at the very end of City). General Seti, who became Seti I, one of Egypt's greatest warrior-kings, was a main character in City, and his story tied in with a mention of him from A Killing Among the Dead. As you can see, the stories are separate and were conceived as independent tales. But they are connected by two families, those of Ramesses and of Nebamun, and by the great imperial city of Memphis. I had to do a revision of Pharaoh's Son this past year to bring it in line with what I now knew of the timeline. The family of Ramesses the Great lived in Memphis from the time that Seti was Vizier of the North, before he ascended the throne. Hori, the crown Prince in that tale, grew up in Memphis. From that point on, the stories follow the timeline, and apart from Kadesh, which is under way and proceeding nicely, and Lord of the Two Lands﻿, I'll do my best to write them in order. In some ways it's easier to do so. I have been asked several times about the order in which my books should be read. My response is that they stand alone. However, since they concern a set group of people over several generations and tie together, and since people (myself included) tend to like to read things in some semblance of order, I am listing the published books in historical order. I will list all of them, published or not, in the right column in chronological order.